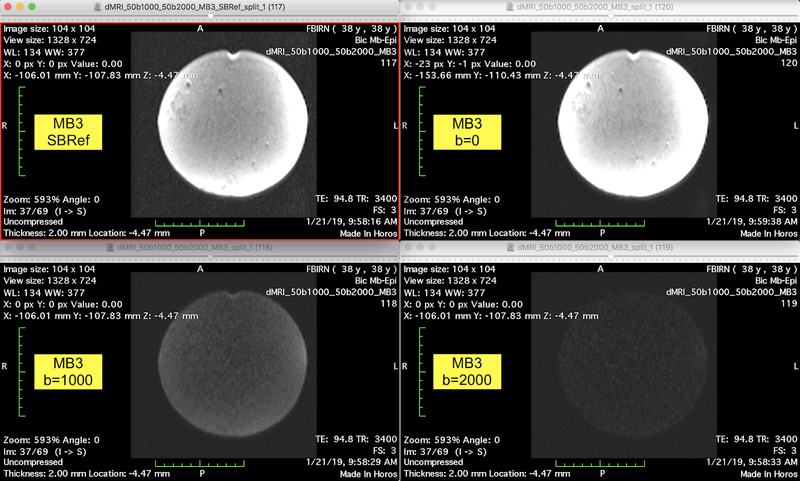 Education, tips and tricks to help you conduct better fMRI experiments. Sure, you can try to fix it during data processing, but you're usually better off fixing the acquisition! 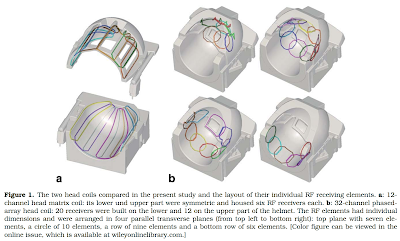 This is a continuation of the previous post looking at MB-EPI on a receive coil with limited spatial information provided by its geometry, such as the 12-channel TIM coil or the 4-channel neck coil on a Siemens Trio. Simultaneous multi-slice (SMS), aka multi-band (MB), offers considerable time savings for diffusion-weighted imaging (DWI). Unlike in fMRI, where MB factors of 4 or more are quite common, in DWI few studies use MB factors greater than 3. While it may be feasible in principle to push the acquisition time even lower without generating artifacts using a large array coil like the Siemens 32-channel coil, we run into another consideration: heating. Heating isn't usually a concern for gradient echo MB-EPI used in conventional fMRI experiments. In fMRI, the excitation flip angles are generally 78° or less. But with DWI we have a double whammy. Not only do we want a large excitation flip angle to create plenty of signal, we also require a refocusing pulse that is, by convention, set at twice the flip angle of the excitation pulse. (The standard nomenclature is 90° for excitation and 180° for refocusing, but the actual angles may be lower than this in practice, for a variety of reasons I won't go into here.) Now the real kicker. The heat deposition, which we usually measure through the specific absorption rate (SAR), scales quadratically with flip angle. Thus, a single 180° refocusing pulse deposits as much heat as four 90° pulses! (See Note 1.) But wait! It gets worse! In using simultaneous multi-slice - the clue's in the name - we're not doing the equivalent of one excitation or refocusing at a time, but a factor MB of them. Some quick arithmetic to give you a feel for the issue. A diffusion scan run with 90° and 180° pulses, each using MB=3, will deposit fifteen times as much heat as a conventional EPI scan run at the same TR but with a single 90° pulse. On a 3 T scanner, it means we are quickly flirting with SAR limits when the MB factor goes beyond three. The only remedy is to extend TR, thereby undermining the entire basis for deploying SMS in the first place. But let's not get ahead of ourselves. With a low-dimensional array such as the Siemens 12-channel TIM coil we would be delighted to get MB to work at all for diffusion imaging. The chances of flirting with the SAR limits are a distant dream. The initial tests were on the FBIRN gel phantom. I compared MB=3 and MB=2 for the 32-channel, 12-channel and neck coils using approximately the same slice coverage throughout. The TR was allowed to increase as needed in going from MB=3 to MB=2. Following CMRR's recommendations, I used the SENSE1 coil combine option throughout. I also used the Grad. rev. fat suppr. option to maximize scalp fat suppression, something that we have found is important for reducing ghosts in larger subjects (especially on the 32-channel coil, which has a pronounced receive bias around the periphery). For the diffusion weighting itself, I opted to use the scheme developed for the UK Biobank project, producing two shells at b=1000 s/mm² and b=2000 s/mm², fifty directions apiece. Four b=0 images are also included, one per twenty diffusion images. (For routine use we now actually use ten b=0 images, one every ten DW images, for a total of 111 directions.) The nominal spatial resolution is (2 mm)³. The TE is 94.8 ms, which is the minimum value attainable at the highest b value used. There are over a hundred images we could inspect, and you would want to check all of them before you committed to a specific protocol in a real experiment because there might be some strange interaction between the eddy currents from the diffusion-weighting gradients and the MB scheme. For brevity, however, I will restrict the comparisons here to examples of the b=0, 1000 and 2000 scans. I decided to make a 2x2 comparison of a single band reference image (SBRef), a b=0 image (the b=0 scan obtained after the first twenty DW scans), and the first b=1000 and b=2000 images in the series. While only a small fraction of the entire data set, these views are sufficient to identify the residual aliasing artifacts that tell us where the acceleration limit sits. "The 32-channel Head coil is highly recommended for 3T. The 12-channel Head Matrix is not recommended, but it can be used for acceptable image quality at low acceleration factors." But what does "low acceleration" mean in practice? And what if your only choice is a 12-channel coil? Following a couple of inquiries from colleagues, I decided to find out where the limits might be. From Kaza, Klose & Lotze (2011). In most cases, the EPI slice direction will be transverse or transverse oblique (e.g. along AC-PC), meaning that we are slicing along the long axis of the magnet (magnet Z axis) and along the front-to-back dimension of the head coil. Along the long axis of the 12-ch coil there is almost no variation in the X-Y plane. At the very back of the coil the loops start to curve towards a point of convergence, but still there is no distinction in any direction in the X-Y plane. Compare that situation to the 32-ch coil. It has five distinct planes of coils along the Z axis. With the 32-ch coil, then, we can expect the hardware - the layout of the loops - to provide a good basis for separating simultaneously acquired axial slices, whereas there is no such distinct spatial information available from the coil elements in the 12-channel coil. In the 12-channel coil, every loop detects a significant and nearly equal fraction of any given slice along Z.
I nearly called this post Low Frequency Oscillations - part III since it closely follows the subject material I covered in the last two posts. But this is a slight tangent. Following the maxim "One scientist's noise is another scientist's signal," in this post I want to look at the utility of systemic LFO to map blood flow dynamics, an idea that was suggested in 2013 by Lv et al. based on the earlier work from Tong & Frederick that I reviewed last post. There is also at least one review of this topic, from 2017. Let me first recap the last post. 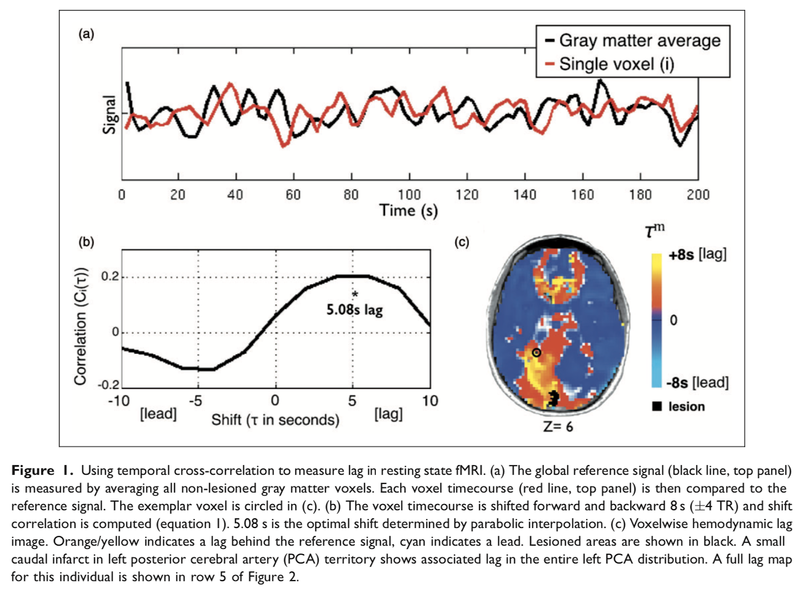 There is sufficient evidence, supported by multiple direct and indirect lines of inquiry, to suggest a blood-borne contrast mechanism that produces a prominent fluctuation at around 0.1 Hz in resting-state fMRI data. (Here, I assume a standard T₂*-weighted EPI acquisition for the resting-state fMRI data.) Furthermore, the same fluctuation can be found anywhere in the body. That is, the fluctuation is truly systemic. The best explanation to date is that non-stationary arterial CO₂ concentration, brought about by variations in breathing rate and/or depth, produces changes in arterial tone by virtue of the sensitivity of smooth muscle walls to the CO₂ dissolved in arterial blood. I shall assume such a mechanism throughout this post, while noting that the actual mechanism is less critical here than whether there is some utility to be exploited. Determine for each voxel which time shift gives the largest cross correlation value, and plot that value (the delay, in seconds) to produce a lag map. There are experimental variables, naturally. The duration of the BOLD time series varies, but most studies to date have used the 5-8 min acquisition that's common for resting-state connectivity. Some studies filter the data before starting the analysis. Different studies also tend to choose different seeds. There are pros and cons for each seed category that I assess in the next section. Time shifts are usually increments of TR, e.g. the lag range might be over +/- 5 TRs for a common TR of 2 sec. And, in producing the final lag maps, some studies apply acceptance criteria to reject low correlations. Fig. 1 from Siegel et al. (2016). In the previous post, I laid out four broad categories of low frequency oscillation (LFO) that arise in fMRI data. The first three categories are mentioned quite often in fMRI literature, with aliasing of respiratory and cardiac pulsations being the best known of all “physiological noise” components. In this post, I am going to dig into the fourth category: blood-borne agents. Specifically, I want to review the evidence and investigate the possibility that non-stationary arterial CO₂ might be producing an LFO that is at least as important as aliased mechanical effects. At first blush, this is unsurprising. We all claim to know CO₂ is a potent vasodilator, so we can think of CO₂ in blood as a sort of changing contrast agent that perturbs the arterial diameter – producing changes in cerebral blood volume - whenever the arterial CO₂ concentration departs from steady state. Why would arterial CO₂ fluctuate? Why isn't it constant? Simply put, we don't breathe perfectly uniformly. If you monitor your own breathing you’ll notice all sorts of pauses and changes of pace. Much of it depends on what you’re doing or thinking about, which of course gets right to the heart of the potential for fluctuations in CO₂ to be a confound for fMRI. I had hoped to begin this post with a review of CO₂ transport in the blood, and from there to relay what I’ve found on the biochemical mechanism(s) underlying vasodilation caused by CO₂. But after several weeks of searching and background reading, I still don’t have sufficient understanding of the biochemistry to give you a concise overview. The CO₂ transport mechanisms are quite well understood, it seems. But how a change in one or more components of CO₂ in arterial blood produces changes in the arterial smooth muscle wall, that is a more complicated story. For the purposes of this post, then, we shall have to content ourselves with the idea that CO₂ is, indeed, a potent vasodilator. The detailed biochemistry will have to wait for a later post. For those of you who simply can’t wait, I suggest you read the review articles given in Note 1. They aren’t aimed at an fMRI audience, so unless you are a biochemist or physiologist, you may not get the sort of intuitive understanding that I have been searching for. 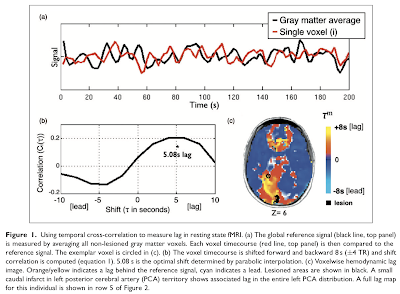 The spatial-temporal dynamics observed by Wise et al. certainly fit a blood-borne agent. That is, we should expect lag variations dependent on the total arterial distance between the heart and the tissue of interest; in their case, the MCA. "we found that the effects of pLFOs [physiological LFOs] dominated many prominent ICA components, which suggests that, contrary to the popular belief that aliased cardiac and respiration signals are the main physiological noise source in BOLD fMRI, pLFOs may be the most influential physiological signals. 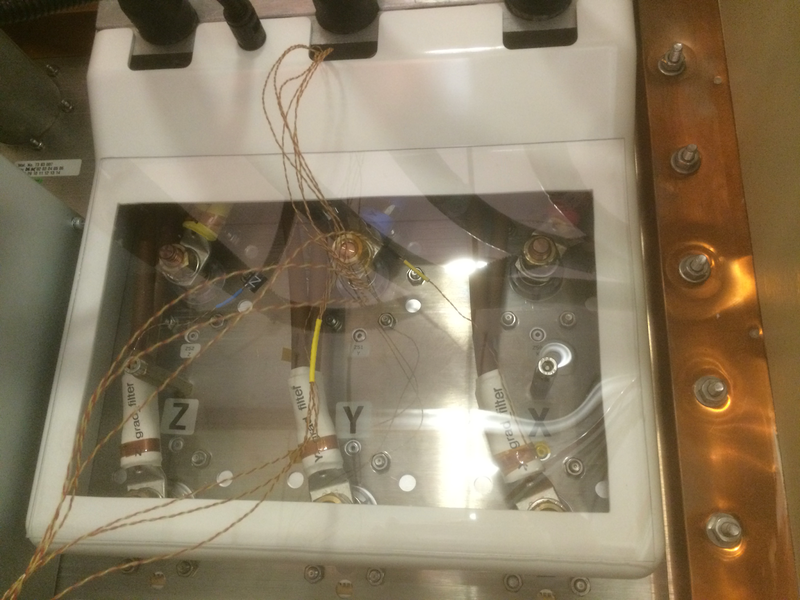 Understanding and measuring these pLFOs are important for denoising and accurately modeling BOLD signals." The description I pulled up from the Google dictionary tells us the essential nature of systemic LFOs: at least some of them are likely to involve the blood gases. And I'll give you a clue to keep you interested. It's the CO₂ component that may end up being most relevant to us. What exactly do we mean by low frequency oscillations anyway? "Low frequency" generally refers to fluctuations in fMRI signal that arise, apparently spontaneously, with a frequency of around 0.1 Hz. The precise range of frequencies isn't of critical importance for this post, but it's common to find a bandwidth of 0.05 - 0.15 Hz under discussion in the LFO literature. I'll just say ~ 0.1 Hz and move on. I added "apparently spontaneously" as a caveat because some of mechanisms aren't all that spontaneous, it turns out. For the purposes of this post we're talking about variations in BOLD signal intensity in a time series with a variation of ~ 0.1 Hz. There may be other brain processes that oscillate at low frequencies, such as electrical activity, but here I am specifically concerned with processes that can leave an imprint on a BOLD-contrasted time series. Thus, neurovascular coupling resulting in LFO is relevant, whereas low frequency brain electrical activity per se is not, because the associated magnetic fields (in the nanotesla range, implied from MEG) are far too small to matter. Is LFO the lowest modulation of interest? No. There are physiological perturbations that arise at even lower frequencies. These are often termed very low frequency oscillations (VLFOs) because, well, we scientists are an imaginative bunch. These VLFOs generally happen below about 0.05 Hz. The biological processes that fluctuate once or twice a minute may well be related to the LFOs that are the focus here, but I am going to leave them for another day. The gradient filter box in the wall behind my Siemens Trio magnet. It's up at ceiling height, in the lowest possible stray magnetic field. The clear plastic cover is custom. The standard box is opaque white. Siemens now has a smoke detector inside the gradient filter box, after at least one instance of the gradient filters disintegrating with excess heat. Still, a clear inspection panel is a handy thing to have. The gradient cables between the filter box and the back of the magnet can also decay with use. If this happens, the load experienced by the gradient amplifier changes and this can affect gradient control fidelity. (More on this below.) The cables can be damaged by excess heat, and this damage leads to higher resistance which itself produces more heating. A classic feedback loop! 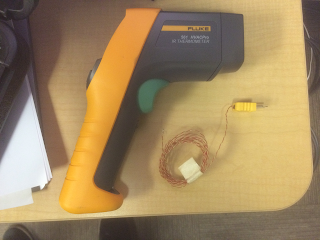 The Fluke 561 IR thermometer and a K type thermocouple, purchased separately. WARNING: this post contains sarcasm and some swearing. COBIDAcq, pronounced "Koby-dack," is the Committee on Best Practice in Data Acquisition. It is based on the similarly dodgy acronym, COBIDAS: Committee on Best Practice in Data Analysis and Sharing. I suppose COBPIDAAS sounds like a medical procedure and CBPDAS is unpronounceable, so COBIDAS here we are. Unlike COBIDAS, however, the COBIDAcq doesn't yet exist. Do we need it? The purpose of this post is to wheel out the idea and invite debate on the way we do business. Hello! Thank you for all of your helpful tutorials including your one on parametric modulation. Quick question: In FSL if I include "0" as a PM value in the third column of my onset file is that problematic? For example say I want to modulate my regressor by a stim value and the values are -3 -2 -1 0 1 2 3. Can I use these values or do I need to transform them to exclude zero (e.g., 1 2 3 4 5 6 7 or something like that)? Thanks in advance! What's up with the first few images of a functional scan?